Is this the Erie Canal? 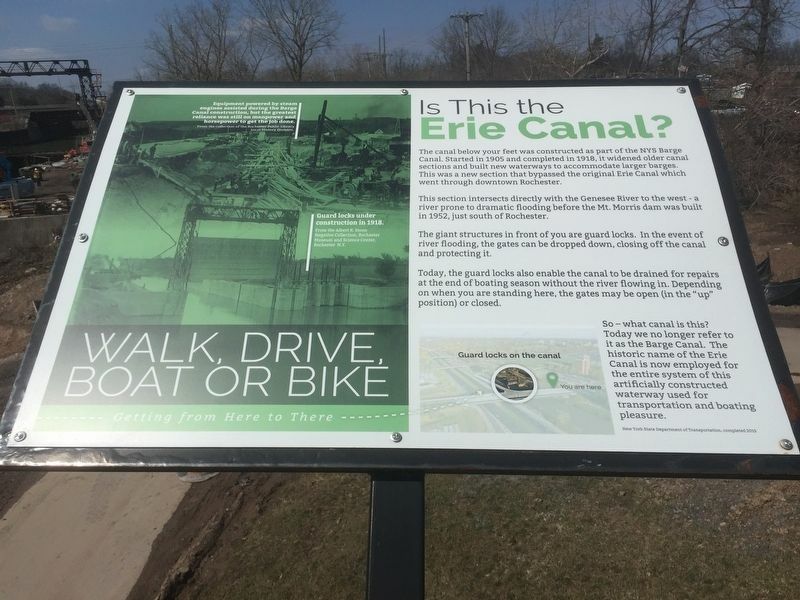 The canal below your feet was constructed as part of the NYS Barge Canal. Started in 1905 and completed in 1918, it widened older canal sections and built new waterways to accommodate larger barges. This was a new section that bypassed the original Erie Canal which went through downtown Rochester. This section intersects directly with the Genesee River to the west - a river prone to dramatic flooding before the Mt. Morris dam was built in 1952, just south of Rochester. The giant structures in front of you are guard locks. In the event of river flooding, the gates can be dropped down, closing off the canal and protecting it. 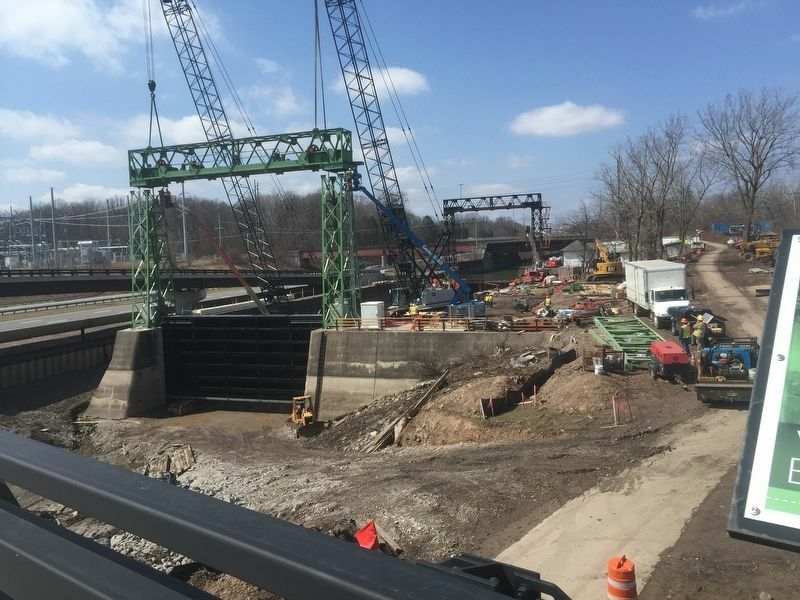 Today, the guard locks also enable the canal to be drained for repairs at the end of boating season without the river flowing in. Depending on when you are standing here, the gates may be open (in the “up” position) or closed. 2015 by New York State Department of Transportation. Location. 43° 6.964′ N, 77° 37.971′ W. Marker is in Rochester, New York, in Monroe County. Marker is on Kendrick Road, on the right when traveling west. Touch for map. On the bridge over I-390. Marker is in this post office area: Rochester NY 14620, United States of America. Touch for directions. Other nearby markers. At least 8 other markers are within walking distance of this marker. The Genesee Expressway (within shouting distance of this marker); The Lehigh Valley Railroad Bridge (within shouting distance of this marker); The Canalway Trail (about 300 feet away, measured in a direct line); Camp Hillhouse (approx. half a mile away); Curtis Point (approx. half a mile away); Clara Barton Red Cross Trail (approx. half a mile away); Bausch & Lomb Riverside Park (approx. 0.6 miles away); Indian Town (was approx. 0.6 miles away but has been reported missing. ). Touch for a list and map of all markers in Rochester. More. Search the internet for Is this the Erie Canal?. Credits. This page was last revised on April 8, 2019. This page originally submitted on April 6, 2019, by Steve Stoessel of Niskayuna, New York. This page has been viewed 49 times since then. Photos: 1, 2. submitted on April 6, 2019, by Steve Stoessel of Niskayuna, New York. • Bill Pfingsten was the editor who published this page.